This site, JensZornSculpture.com, presents works in sculpture that celebrate discoveries in science, that explore interpersonal relationships, and that express political ideas. Here you’ll find not only photographs of the sculptures but also descriptions of their rationales and the evolution of their designs. The sculptures may seem quite abstract to the lay viewer, but their three-dimensional forms derive from the two-dimensional blackboard sketches and written symbols used by scientists when they discuss the physics to which the sculptures refer. The form of each relates clearly to the essence of the achievement being celebrated. The sculptures are intended to be generally provocative for the general public and specifically evocative of the physical process for persons who are familiar with the relevant science. I have worked for many years as professor of physics at The University of Michigan. My work in sculpture started in 1996 when I offered to make a piece to commemorate the work of Arthur Rich (1937-1990), a member of the Michigan physics faculty renowned for his research on positrons and positronium who died of cancer while still at the height of a brilliant career. The success of that sculpture led to commissions for works that are more fully described below. Most persons on the Ann Arbor campus of The University of Michigan, whether visitors, students, faculty, or staff, are unaware of the many important discoveries that have been made by Michigan scientists. To address this I have worked over the past decade to create sculptures as visual reminders of Michigan’s pioneering work. Outdoor pieces on our campus include recognitions of the discovery of microwave spectroscopy, the first measurement of the free electron’s magnetism, the development of off-axis holography, the determination of positronium’s lifetime, and the theoretical work that led to the 1999 Nobel Prize in Physics for Martinus Veltman. Permanent indoor installations include a sculpture in Mason Hall that celebrates the development of coherent fiber optics, and sculpture in Angell Hall that symbolizes Michigan’s work for the advancement of under-represented minorities. These are described in Section 1A. The favorable reception of these sculptures at Michigan led to installation of physics-related commemorative sculptures at MIT, at Stanford, at the University of Nevada , at the East Lansing High School, and at the National Autonomous University of Mexico in Mexico City. These are described in Section 1B. The Michigan Physics Department has frequent need to recognize special occasions or to celebrate individual achievements. 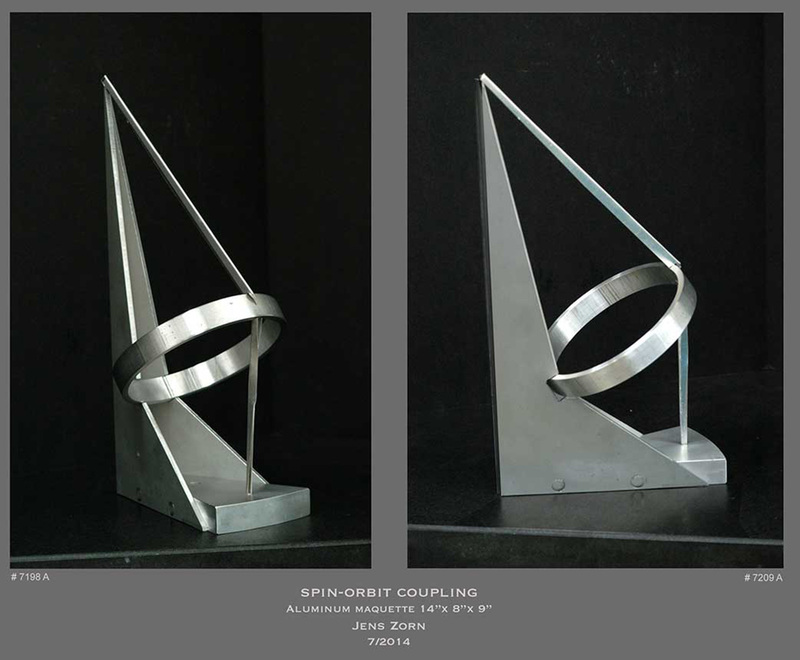 I have often provided sculptural objects to meet this need; many of these (the Physics Olympiad Trophies, for example) have a purely abstract form, but some others have a representational aspect . These sculptures are described in Section 2 . I have explored the ways in which sculpture can represent various aspects of interpersonal relationships including individual emotion, two-person situations (e.g., man and woman) and three-person situations (e.g., parents and child). Some of these are participatory sculptures in that the viewer is invited to arrange the parts as a non-verbal way to convey attitudes and feelings. Examples can be found in Section 3. I often find pieces of metal in shapes that suggest transformation into useful, decorative, or amusing objects… Examples are gathered in Section 4. For many years I have done physics-relate graphic arts. This work ranges from posters and instructional films to book jackets (e.g. for the 2nd and 3rd editions of Griffiths Electrodynamics) and departmental photography. Some examples of these are in Section 5.